This German Sausage Soup from Bavaria is a hearty soup eaten in Franconia and Swabia on butchering day, making it a cold-weather soup. 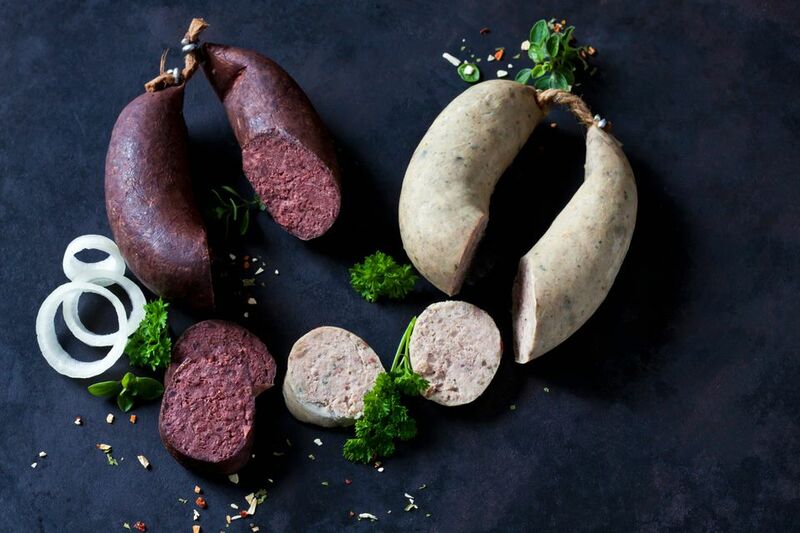 Strictly speaking, the soup is made from the kinds of German sausages (typically blood and liver sausages) which burst during cooking and must be eaten immediately on butchering day. It is known as metzelsuppe or kesselsuppe. A metzger is a "butcher" and a Kessel is a "pot." When you cook sausages at home, if they all make it through the cooking process, just make the soup with ones that haven't burst. The soup is too good to leave to happenstance and tradition. Recipe courtesy of the Bayerisches Staatsministerium für Ernährung, Landwirtschaft und Forsten. In a large saucepan or Dutch oven, sauté the onion rings in 2 tablespoons hot lard. Add 6 to 7 cups water or broth. Remove the casings from the German blood sausages and the German liver sausages, and add to the soup. Stir in 1/2 teaspoon dried marjoram. Bring to a boil, reduce heat and simmer for a while. Season to taste with salt freshly ground pepper and nutmeg as necessary. Cut the 4 slices of graubrot bread into cubes and sauté in butter to make croutons. For a lighter calorie load, you alternatively can coat them with butter spray or spray oil and bake until crispy. Serve the soup in warmed bowls. Sprinkle croutons and chopped chives on top. In Swabia, they sometimes add spaetzle to the sausage soup for an even heartier dish. Germany is no stranger to nose-to-tail eating, which means not wasting one part of a slaughtered animal. Try, for instance, blutwurst, which are sausages made with less than primo cuts of chopped, cooked pork left over from the butchering and fresh blood mixed with vinegar before it has a chance to clot. It also can include bread crumbs, onions, oats, milk, thyme, and marjoram. It can either be cooked or lightly smoked and/or air-dried. Another example is blood soup, known as swattsuer or schwartz-sauer (literally, "black-sour") made from the remains of the slaughter. Ribs, belly, pigs' feet, ears, snouts and such are cooked in a water-vinegar bath with peppercorns and onions. When the meat is tender, it is cut into bite-sized pieces. The broth is mixed with some of the fresh pig blood, the pork is tossed back in along with more seasonings and there you have it. The soup typically is served with Salzkartoffeln (salt potatoes) or buckwheat or flour dumplings. German soups range from a broth-based wedding soup to One-Pot Meals (eintöpfe) served over noodles or potatoes, and both are hearty and satisfying.